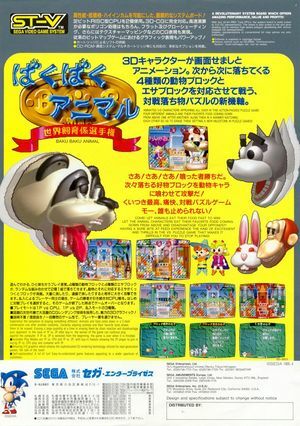 Baku Baku Animal (ばくばくアニマル) is a falling gem type of puzzle game for two players. The player must line up falling blocks of animals and food. When an animal is aligned adjacent to a tile of its favored food, the animal eats the food. Larger groups of connected food of the same type scores higher when eaten. When animals eat food random blocks fall on the opponent's area. Thus blocking your opponent. This page was last modified on 20 March 2017, at 23:36.